Harold was born on 21 June 1892 to John and Martha Jane Trueman (nee Warrington). He grew up with his sisters Edith, and Sarah Elizabeth (Bessie) and brother Gerald (also on the memorial) at Higher Hardings Farm, Sutton, eventually moving to Sandyway Farm, Clulow Cross, Wincle where his sisters Doris and Phyllis were born. All the children were educated at Wincle School. He spent some time working at Langley Hall in Sutton as a wagoner and then at Furness Pool Farm in Gawsworth as a teamsman. It was whilst there, on 25 January 1916, he attested his willingness to serve in the army. His service records show he was only just over five feet tall. However he wasn’t mobilised until June 1917. Initially he joined the King’s Shropshire Light Infantry in June 1917 as private no. 33777 and received his training at Bush Camp, Pembroke Dock, South Wales. They embarked for France from Southampton on 19 October but two days after his arrival in Rouen, on 25 October he transferred to 16th Battalion Cheshire Regiment as private no. 51723. The 16th Cheshires was one of the so called Cheshire Bantam Regiments because all the men they recruited had to be between 5’ and 5’3” tall; at 5’ 0¾“ Harold was perfectly qualified. (Earlier on in the war the minimum height for soldiers had been 5’3” but such was the desperate need for more recruits this was reduced.) He would have joined the Bantams at De Wippe as one of 236 ORs (ordinary ranks) drafted in as replacements for the casualties sustained near Houlthulst Forest, a week or so earlier. Most of November was spent maintaining a supply tramway. That was followed by a time in the trenches near Poelcapelle, a week’s rest and then training at the Infantry Brigade School near Poperinghe. In letters home he said they’d had an enjoyable Christmas but complained otherwise about the freezing cold weather and general lack of food. The battalion had another spell in the trenches in January and Harold had contracted bronchitis so was out of action until early March. 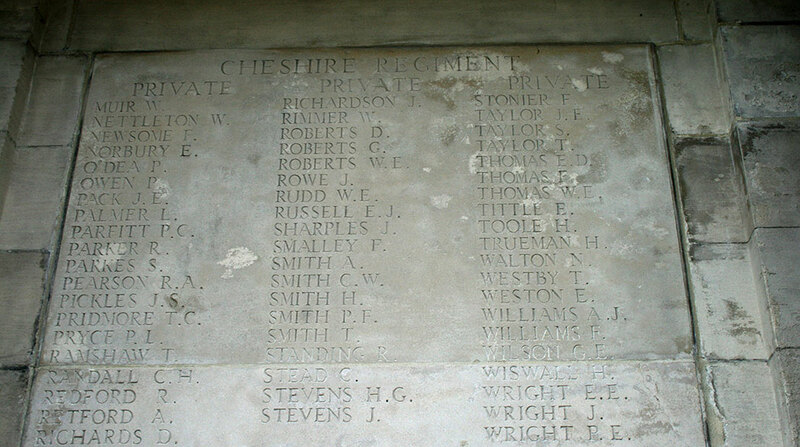 Meanwhile in February 1918 the 16th Cheshires were disbanded as part of a radical shake-up of army divisions; Harold was one of those transferred to the 15th Cheshires – another Bantam Regiment - on 16 March 1918. In his last letter to his sister Edith that month he mentioned being transferred to another regiment and that he had travelled back to the front and “hopes to be back soon". On 21st March the Germans launched a ferocious offensive near the Somme River. The 35th Division, which included the 15th Cheshires, was rushed to the battle front. On 22nd March they marched 8 miles to the railhead at Ypres, sat in cattle trucks for a very uncomfortable 12 hour journey then had to match a further 17 miles to their billets in a village called Suzanne finally arriving at 4am on the 24th. But immediately on arrival orders were received to proceed to Mericourt in support of the front line troops to engage the enemy. This they did with some success at first but overwhelming numbers of the enemy slowly pushed them back again and several companies were surrounded and the men either killed or taken prisoner. By the end of the day the battalion was severely depleted and those still alive were absolutely exhausted. Heavy fighting continued for the next few days but although the Germans managed to advance some 40 miles the allies held the line along the River Ancre. Harold was reported missing on the 28th and eventually his death was accepted as having occurred on the 24th. His parents made several enquiries to the War Office when his letters ceased but it wasn’t till May 1918 they heard he had been posted as missing and it was another year before they received official notification of his death. 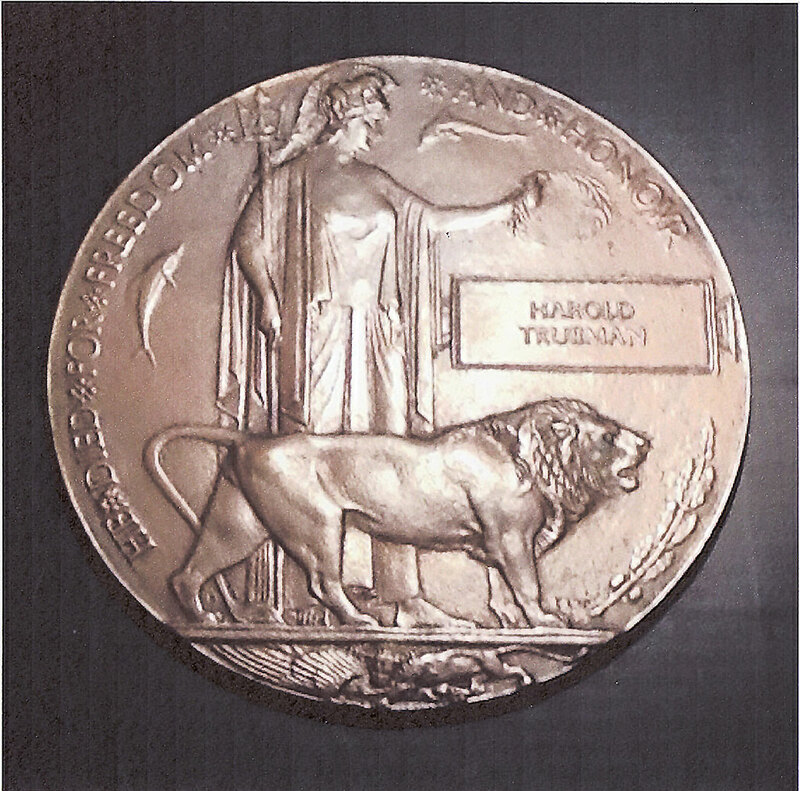 Harold is commemorated on the Pozieres Memorial C.W.G.C Panel 35 and 36. He was awarded the British War Medal and Victory Medal. His father received £13 1s 6d of which £5 was a war gratuity and the rest back pay.